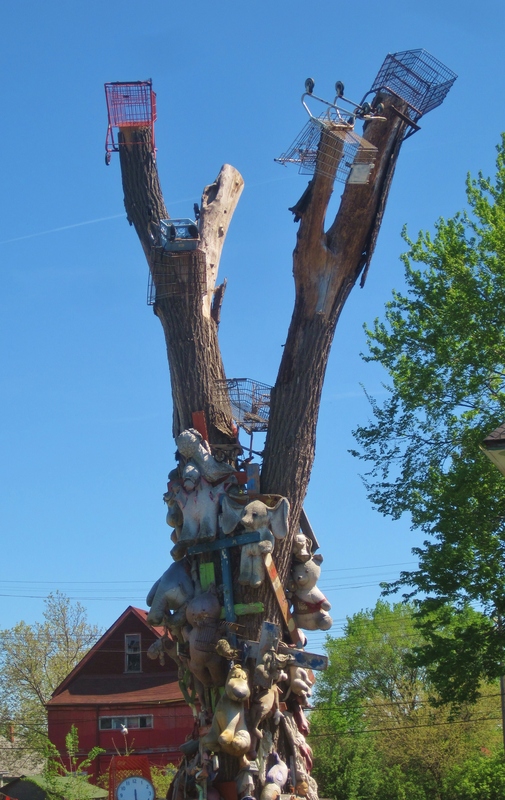 When I expressed my thoughts about the Heidelberg Project to an off-duty bartender, she grew displeased and defensive, the awkward elephant slowing creeping into the room and settling down next to us. We were sitting at a round hightop capping off the evening with a few brews, and the infamous street had been beating around my brain all day. My friends said little, allowing me to dig my own hole with the local patrons. Let me get this out of the way: I highly suggest you go check it out/take a tour when you’re passing through or visiting Detroit. 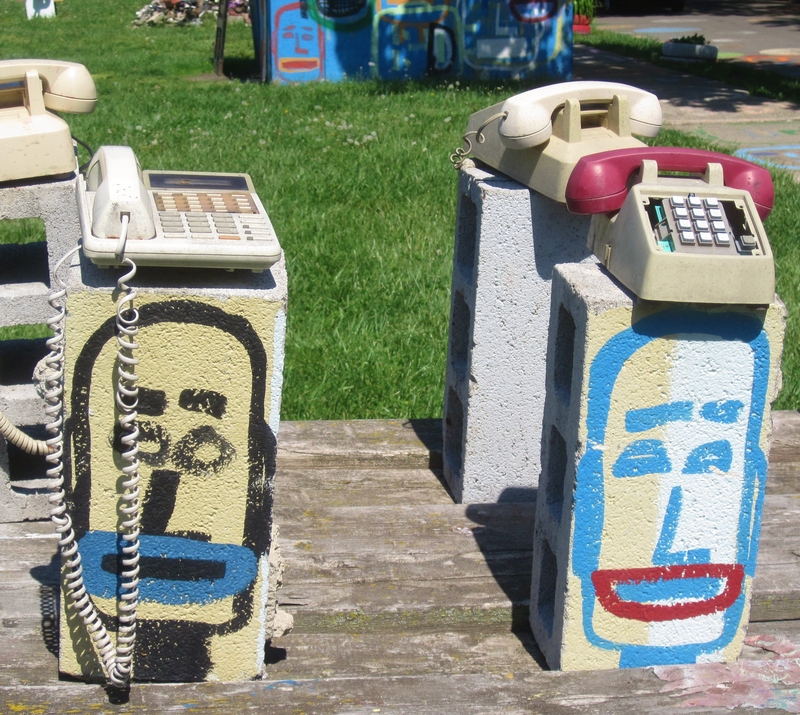 It is a world-wide known site that carries immense political importance in addition to artistic expression. 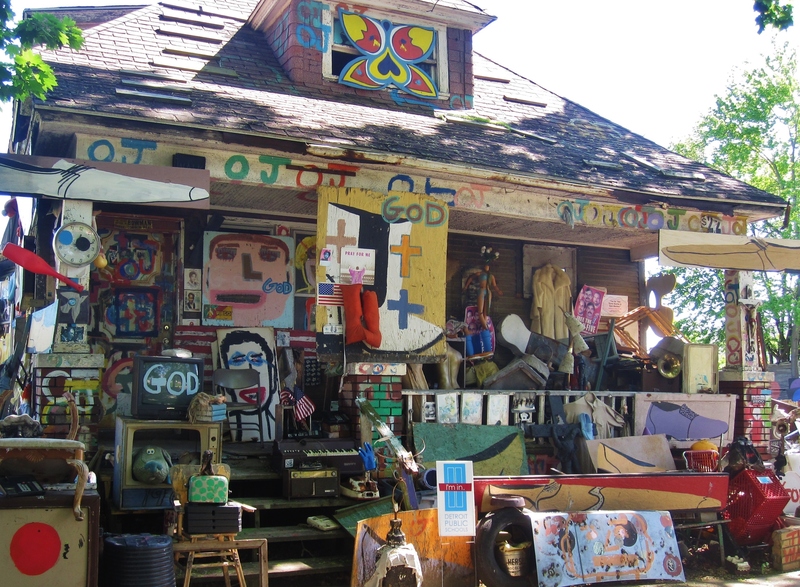 It can be looked upon as an outdoor art museum, if nothing more. 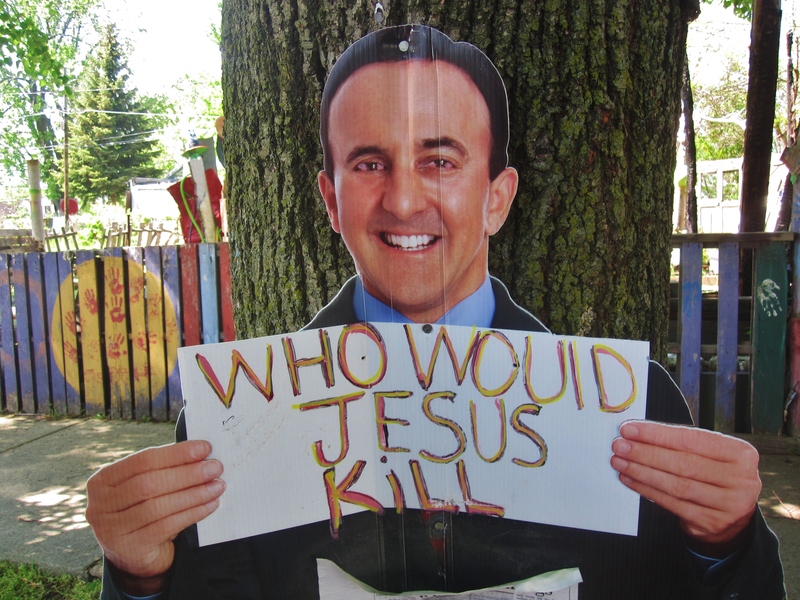 With that said, let’s go a little deeper into the controversy swirling amongst the people of Detroit. I wasn’t trying to offend anyone that night at Tommy’s Bar – nor is that my purpose now – but I do want to talk it out, throw out some ideas. In a world of love/hate political standpoints, wouldn’t informed neutrality be an interesting mindset? I think it’s all right to be down the middle on some things – to understand both sides – and I’ll be honest: While my first impression was that Heidelberg is certainly creative, I’m having a hard time deciding whether I find that creativity cool or callous. 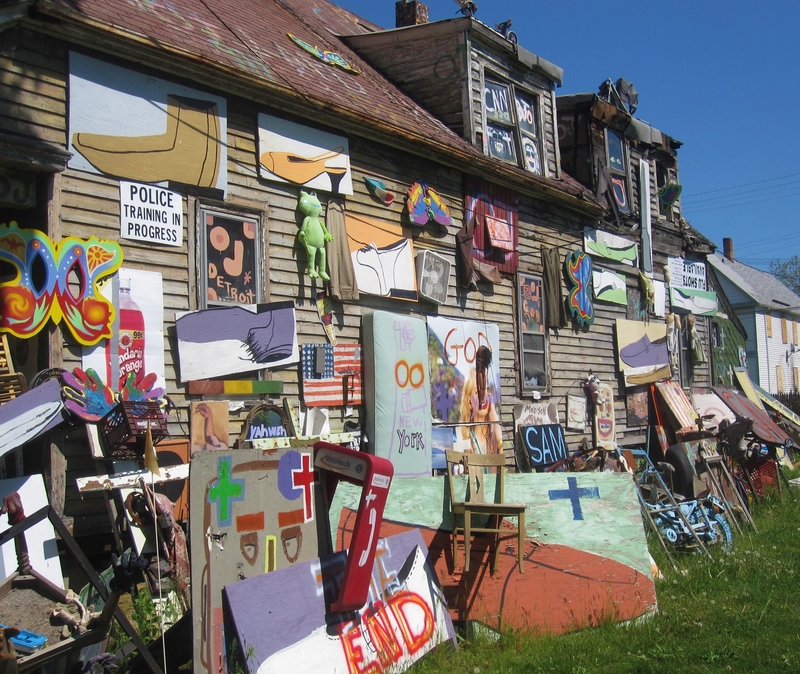 The cool: According to their website, the mission of the Heidelberg Project is to inspire people to use artistic expression to enrich their lives and improve the social/economic health of the greater community. They are engaged in art education, working to be sure it is an everyday aspect of students’ curriculum throughout Michigan. 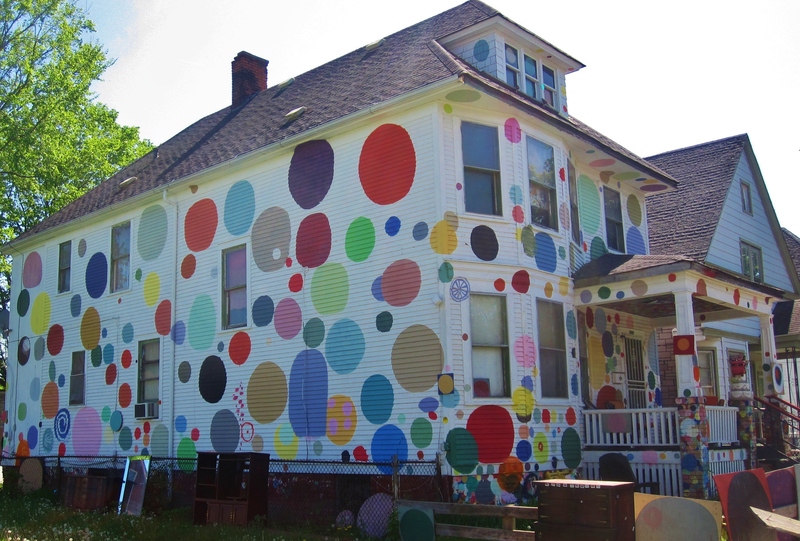 The Project began with the decorating of houses, and it successfully transformed a neighborhood. To a place where people were once afraid to walk, visitors flocked. 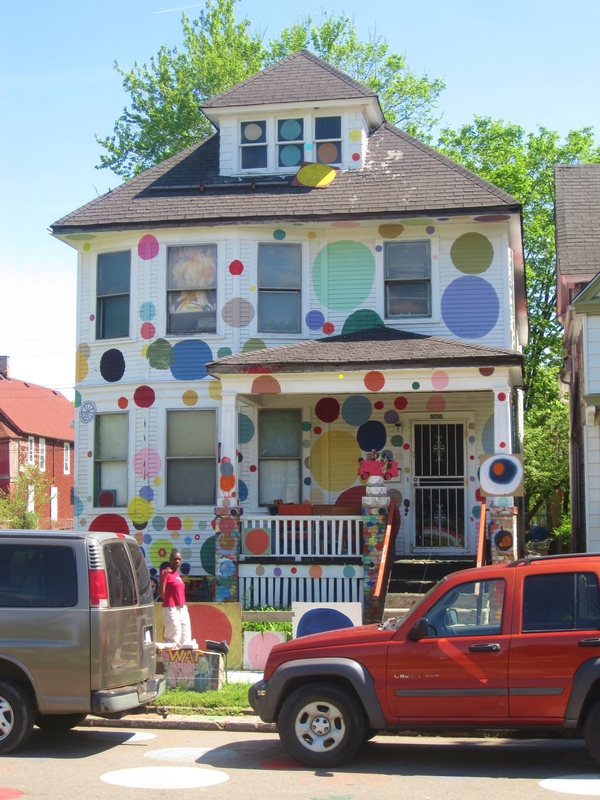 Founding artist Tyree Guyton included children in his daily work, with the main goal of developing the city’s first indoor/outdoor museum. Those are good things, there’s no denying that – the intention is certainly there. And I think people should be able to express themselves any way they want. Art is a matter of opinion – just because pop music draws more ears (and more money) does not mean that underground styles are less valid. However, the best intentions don’t always brew the best results. 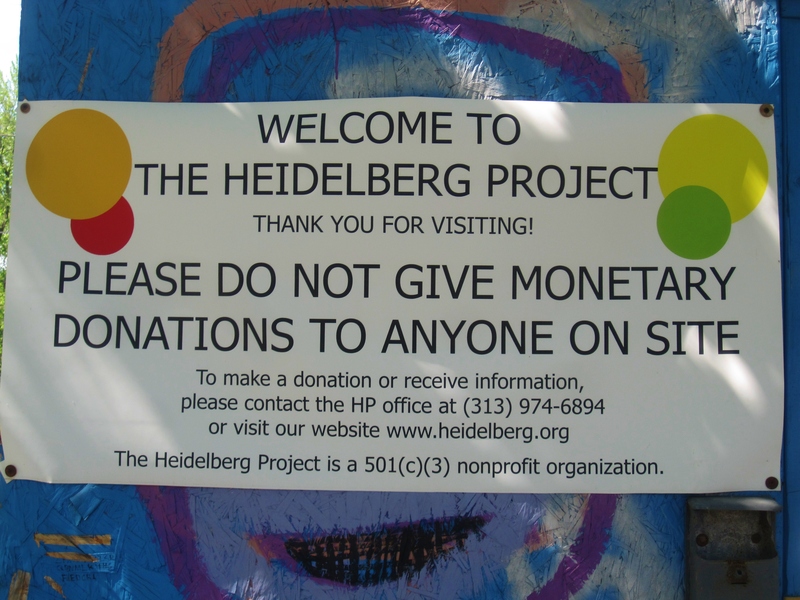 The callous: The Heidelberg Project is indeed a political protest, if not entirely then certainly partially (it is meant to draw attention to forgotten neighborhoods). There’s nothing wrong with standing up for yourself – I’ve got no problem with that – but I do think one needs to be measured in their methods. Looking down on the issue from a distance, I find their approach a bit hypocritical – you can’t put unity and compromise in one hand and wave the middle finger with the other. I think sometimes interest groups forget that abrasiveness does not breed brotherhood (and many citizens as well as the government have expressed their opposition to Guyton’s art). This piece is called "Haiti." The bartender said to me that perhaps the government should consider the same. I agreed, completely – it takes two to tango. But, at some point, I think you need to consider what the main goal of the project is. 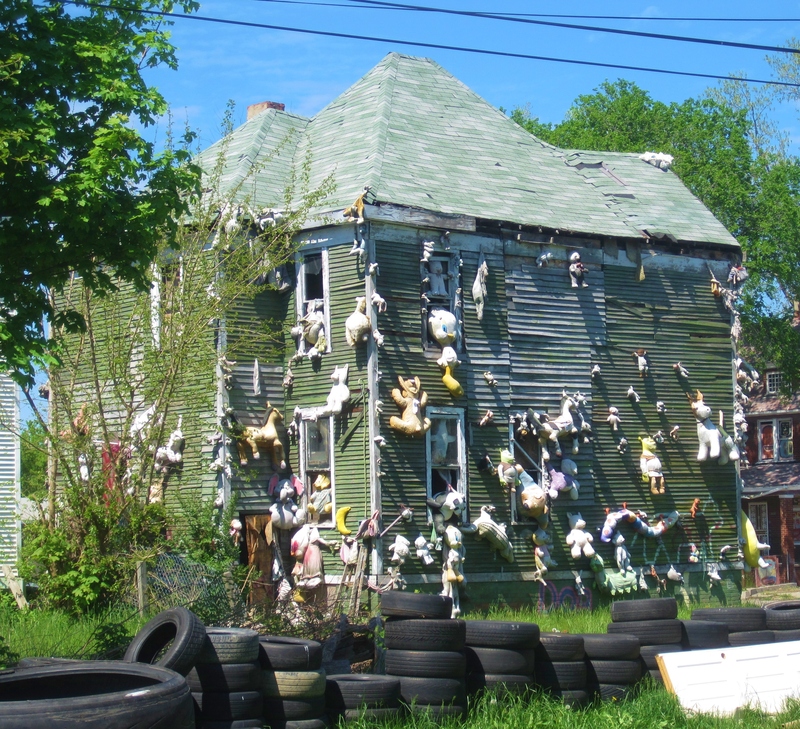 The bartender said it was to rebuild the neighborhood. The government has twice destroyed parts of the project citing public safety, and no one has moved back into the neighborhood. I found myself wondering what has been accomplished. I understand the process is part of the purpose, however at some point you would think some positive results would be required to validate the path and distribution of finances. Just to play devil’s advocate: What if the time, energy, and land went towards building parks and playgrounds? 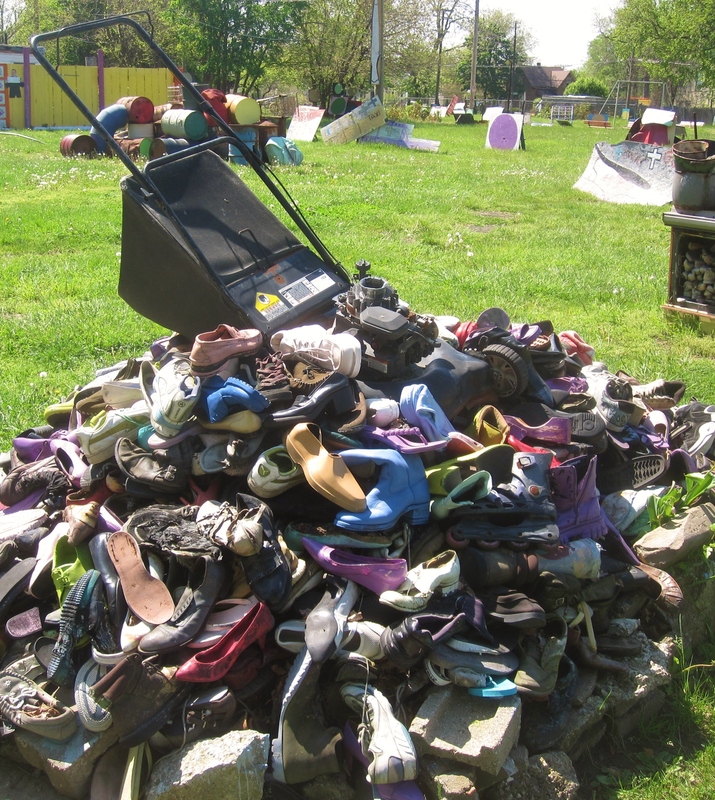 A pile of shoes with a lawnmower on top is full of symbolism and beauty, but would it not be better suited for a museum? 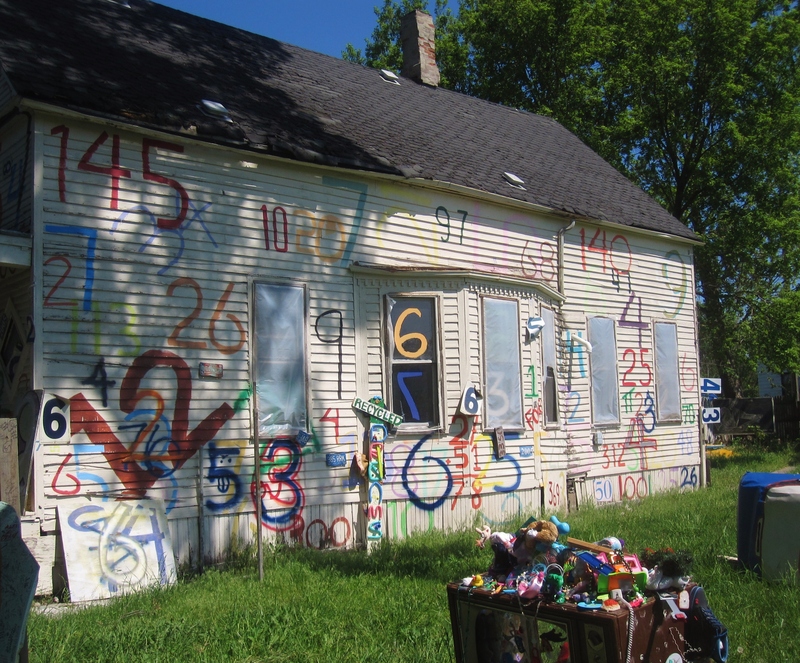 The Heidelberg Project seems to be thinking on those terms of late – it plans to open a House that Makes Sense Center as part of what they refer to as their Cultural Village, a headquarters made from found and recycled materials (which will include an exhibition space, artist-in-residence space, a children’s workshop, and a library). There’s some interesting stuff going on, for sure, and I’ll be following along to see how it plays out in the next few years. Make a point to head over at some point and shoot me a note with your thoughts. Is it trash or treasure, or both? 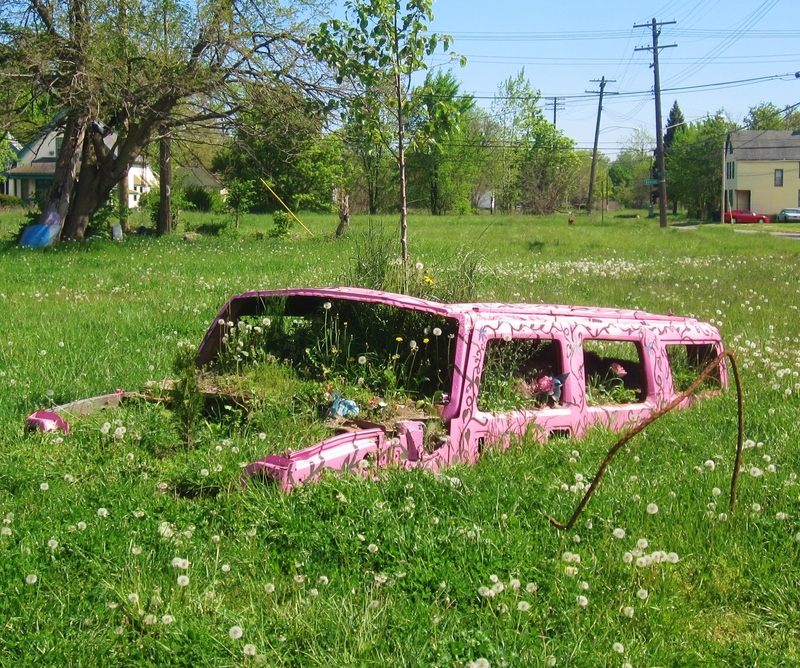 The death of the auto industry.